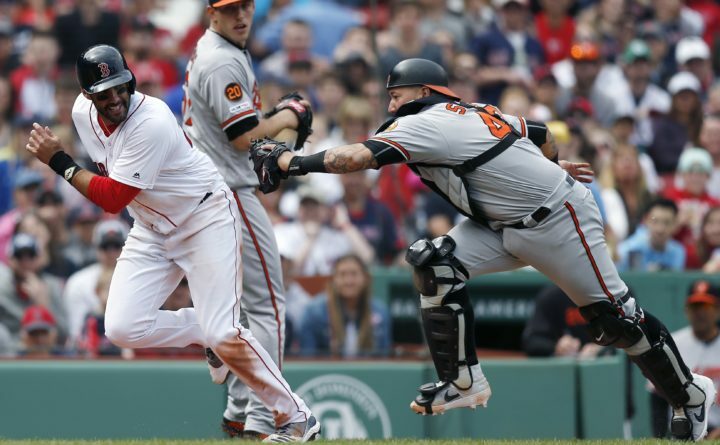 Baltimore Orioles' Jesus Sucre (40) catches Boston Red Sox's J.D. Martinez in a rundown at home plate Sunday during the fourth inning of a baseball game in Boston. Shortly after Tiger Woods won the Masters, the Red Sox put a video of his final putt with Survivor’s song “Eye of the Tiger” playing in the background in the middle of the fifth inning.